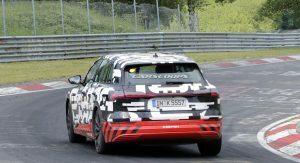 Electric vehicles used to been seen as slow-moving penalty boxes on wheels but that’s no longer the case as modern electric vehicles feature impressive performance and acceptable ranges. 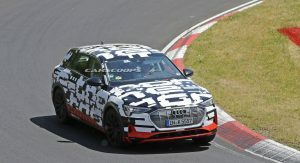 The Audi E-Tron is seeking to accomplish both feats and the model was recently spotted undergoing testing on the Nürburgring. 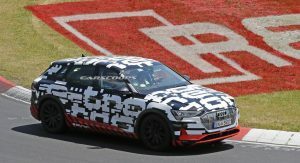 Previewed by a near-production prototype at the Geneva Motor Show, the E-Tron represents a major step for Audi as it will become the company’s first electric vehicle since the limited production R8 e-tron. 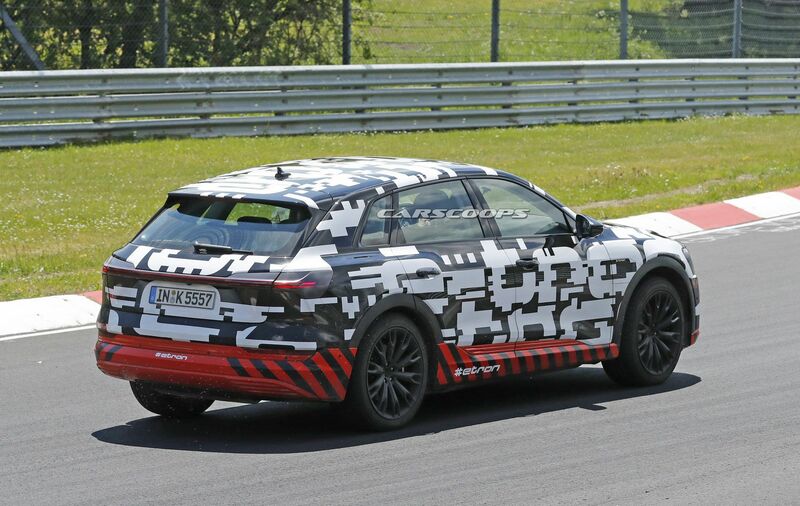 However, the crossover will be significantly more affordable and practical than the electric supercar. 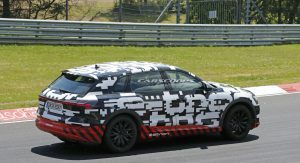 The design hasn’t changed since the prototype was unveiled in March and we can see it will have an aerodynamic grille that is flanked by distinctive headlights and triangular air intakes. 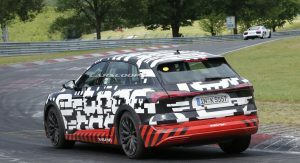 The rest of the design is a mix of crossover and wagon styling cues as Audi wants to embrace the popularity of crossovers while also benefiting from the improved aerodynamics that wagons offer. 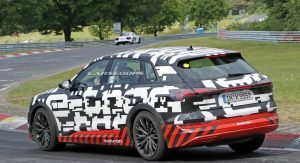 Audi has been slowing revealing details about the car and the company has already confirmed the model will have a 95 kWh lithium-ion battery which will enable the E-Tron to travel more than 400 km (248 mi) in the WLTP driving cycle. An 11 kW AC charger will come standard and it will enable the model to be charged at up to 2.3 kW when connected to a 230 volt household outlet. When a 400 volt three-phase outlet is used, the model can be charged at its full 11 kW capacity. Unfortunately, even in the latter configuration it will take approximately 8.5 hours for the battery to be fully charged. 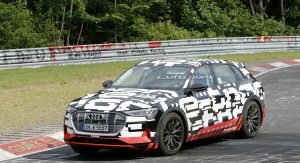 Owners with limited time will have some options as Audi will offer a optional “connect charging system” which features an additional 11 kW charger. 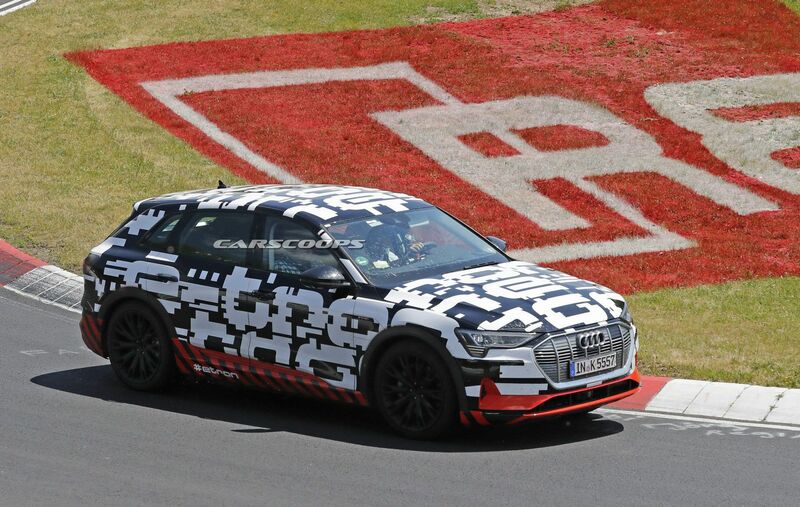 The model has also been designed to work with fast-charging stations that feature a capacity of up to 150 kW. 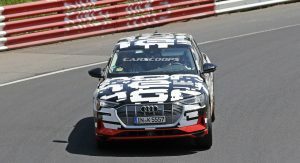 When one of them is used, Audi says drivers can be ready for the next leg of a long-distance journey in less than 30 minutes. 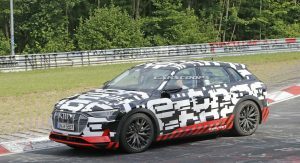 Audi hasn’t said much about the E-Tron’s powertrain lately but the original concept had three electric motors which produced up to 429 hp (320 kW / 435 PS) and 590 lb-ft (800 Nm) of torque. 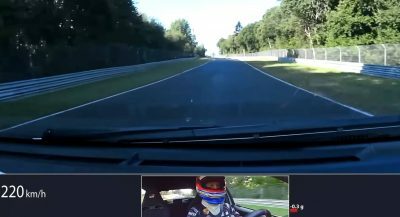 This enabled the all-wheel drive model to rocket from 0-62 mph (0-100 km/h) in 4.6 seconds before hitting a limited top speed of 130 mph (210 km/h). 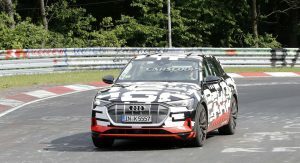 The Audi E-Tron will be unveiled on August 30th and the crossover is scheduled to be launched in Europe before the end of the year. Charging remains a problem for all these new electric vehicles, a problem that could easily be overcome with the inclusion of a small 50 HP gasoline or diesel engine and generator the size of a 12 pack of soda, with a 5 gallon gas tank, all of which could easily fit in between the outer body of a car without taking up any interior space. This could charge the battery at any time on its own whenever needed. 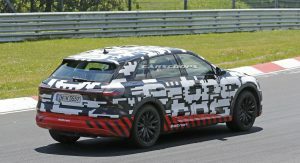 It would make these vehicles much more practical, and far easier to sell worldwide in places where electric power is not reliable or easy to retrofit . A simple modular unit that could be fitted to any vehicle in a product line at minimal cost. 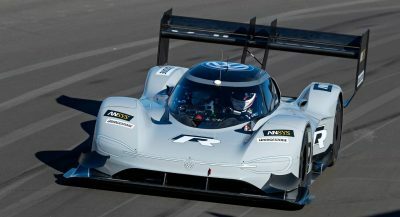 The first company to design such a vehicle will be selling electric powered cars and trucks to everybody from the military to commercial applications. A simple back up like this will make all the difference until the world fully converted to electric charging. That only adds complexity and weight, it makes no sense. The new charging infrastructure built by the Germans will use 350kw, that can add ~300km in under 15mins. 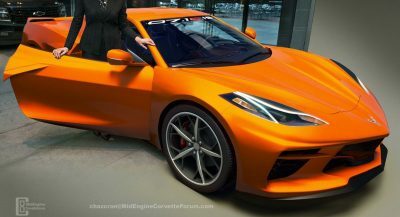 People want electric cars, not hybrids. Variable voltage chargers are in development which will adapt to each battery with the capacity to go up to 800 volts. Charging isn’t an issue. Why have all that grille when there is no function?